Now that we know Anthony Johnson will get next crack at UFC light heavyweight champion Jon Jones’ crown following Saturday’s upset victory over Alexander Gustafsson, let’s look ahead to this weekend’s UFC 183 event that could produce the middleweight division’s next top contender. 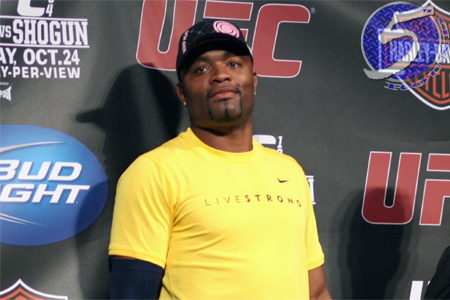 Despite coming off two straight losses to current 185-pound champ Chris Weidman, with his most recent defeat resulting in a 13-month layoff due to a broken shin, UFC president Dana White has promised Anderson Silva (pictured) an immediate shot at Weidman with a win over Nick Diaz this Saturday in Las Vegas. A pivotal welterweight affair between Kelvin Gastelum and Tyron Woodley serves as the co-main event. Lightweights Joe Lauzon and Al Iaquita get third-to-top billing. All three matchups were featured on Sunday’s “Countdown to UFC 183” episode. If you missed it, we’ve got your back.